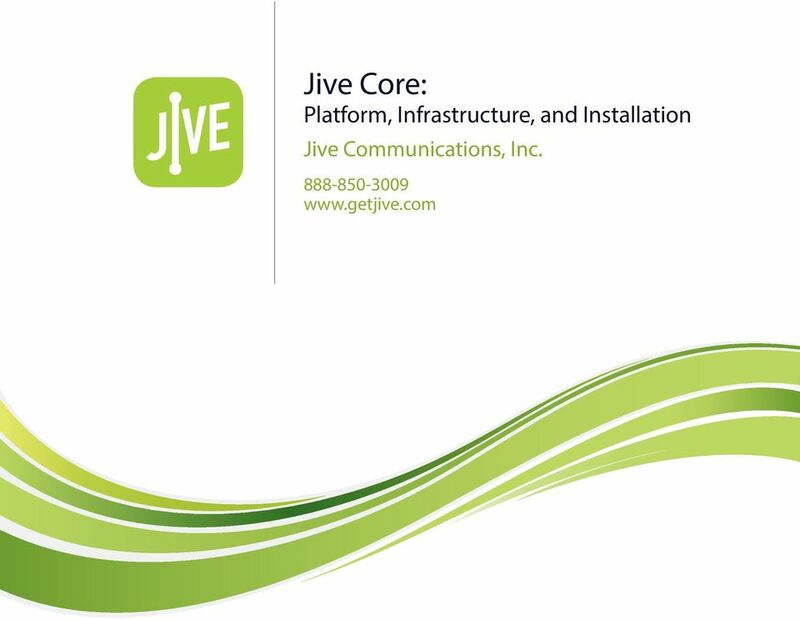 Download "Jive Core: Platform, Infrastructure, and Installation"
3 2 Jive Core can operate with a variety of network configurations. Four of these configurations are described in Figure 2. The following diagram describes the logical placement of Jive IP phones, Jive Voice Gateway, and the Jive modem (if applicable). In a typical Jive Hosted VoIP deployment, IP handsets are connected to a network configured to prioritize voice over other traffic types, preserving voice fidelity. These Quality of Service (QoS) configurations are described later in this document. Site 1 has no direct WAN connection, but uses an aggregation router at Headquarters to connect to the Internet, Jive Core, and eventually the PSTN. Notice that no WAN survivability options are installed at this location. Site 2 The Site 2 section of Figure 2 depicts another remote location connecting to Headquarters through a pointto-point connection. However, Site 2 employs its own Jive WAN connection and WAN survivability. This ensures Site 2 will have connectivity to the PSTN in the case of a WAN failure. Headquarters The Headquarters section of Figure 2 describes one of the most common network configurations. Network equipment both physically and logically separate voice and data traffic to separate WAN connections. Headquarters also has different sites connecting to it (Site 1 and Site 2) to utilize its network resources and WAN connections. VLANs are configured to separate voice and data traffic. Though connected to the same core switch, these VLANs logically separate and deliver traffic to either the Jive Voice Gateway (voice) or an aggregation router (data). Headquarters also depicts a Jive modem with a dedicated Jive WAN connection (usually Jive Broadband). If desired, equipment can be deployed to allow for local WAN survivability to the PSTN (e.g. route emergency calls over an analog line). Site 1 The Site 1 section of Figure 2 depicts a satellite location connecting to Headquarters via a point-topoint connection. Site 3 Site 3 in Figure 2 shows another common deployment for clients using Jive Core. Although VLANs logically separate voice and data traffic, no physical separation exists. Both voice and data traffic use the same WAN connection, with QoS configured to ensure voice traffic gets highest priority. Site 3 also has analog POTS lines which connect directly to the PSTN for survivability in case of WAN failure. 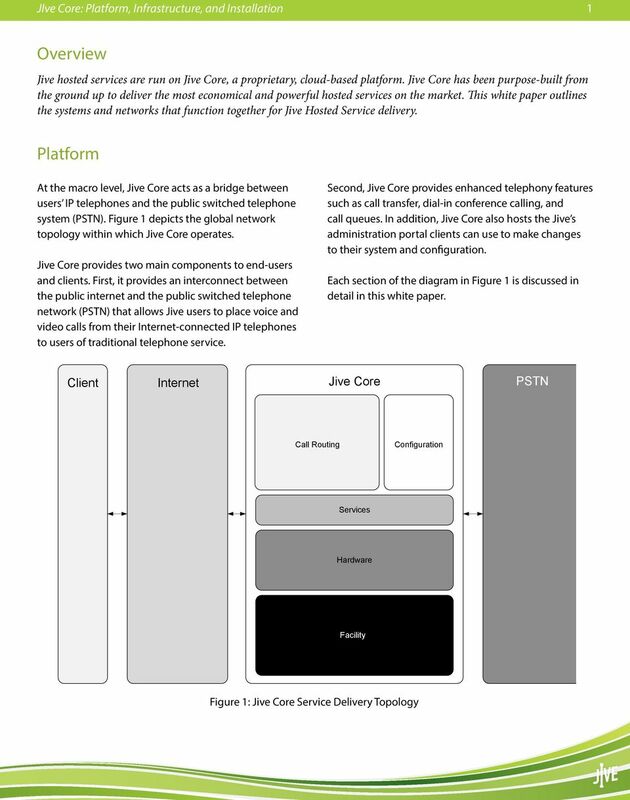 Jive Core Described below in more detail, Jive Core performs a variety of functions. From managing on-premise hardware to providing enterprise-grade functionality and PSTN integration, Jive Core is the platform powering Jive Hosted VoIP. Facility The bedrock of Jive Core is the facility that houses it. Jive selects only Top-Tier facilities for our platform. Redundant, highly-available utility feeds, data feeds, cooling, and backup power all contribute to the stability and uptime of the system. Meshed switching, routing, firewalls, and network links ensure a highly-available voice and data services. 6 5 Hardware Jive s computing platform is built on x86-based hardware, ensuring easy access to additional components as necessary. Computing resources are virtualized and clustered to create a true cloud computing environment. Top-quality network equipment (Cisco, Brocade, and Juniper) provide highlyavailable access to all computing resources. Services Different services perform different functions within Jive Core. Each service runs in its own virtualized node, and each is highly redundant. Call Infrastructure The Call Infrastructure component of Jive Core is where call processing, routing, and end point registration take place. 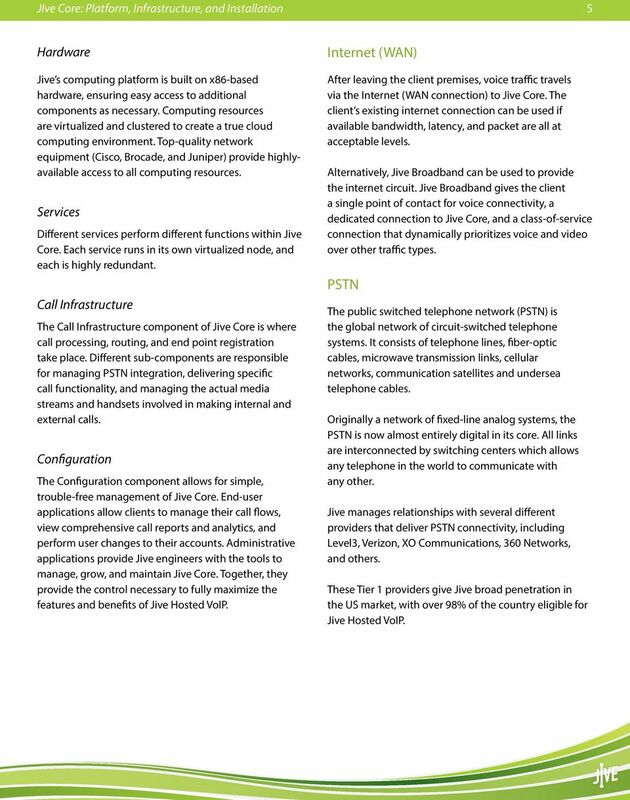 Different sub-components are responsible for managing PSTN integration, delivering specific call functionality, and managing the actual media streams and handsets involved in making internal and external calls. Configuration The Configuration component allows for simple, trouble-free management of Jive Core. End-user applications allow clients to manage their call flows, view comprehensive call reports and analytics, and perform user changes to their accounts. 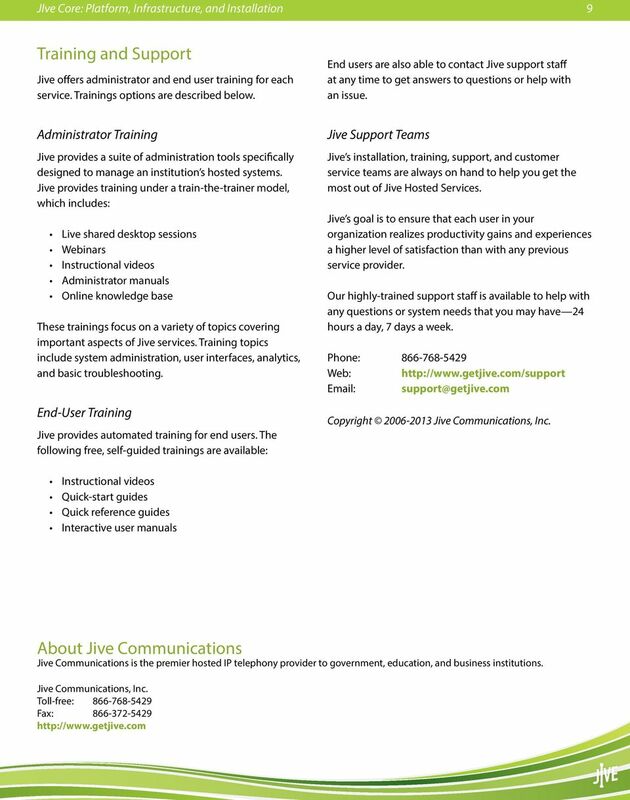 Administrative applications provide Jive engineers with the tools to manage, grow, and maintain Jive Core. Together, they provide the control necessary to fully maximize the features and benefits of Jive Hosted VoIP. Internet (WAN) After leaving the client premises, voice traffic travels via the Internet (WAN connection) to Jive Core. The client s existing internet connection can be used if available bandwidth, latency, and packet are all at acceptable levels. Alternatively, Jive Broadband can be used to provide the internet circuit. Jive Broadband gives the client a single point of contact for voice connectivity, a dedicated connection to Jive Core, and a class-of-service connection that dynamically prioritizes voice and video over other traffic types. PSTN The public switched telephone network (PSTN) is the global network of circuit-switched telephone systems. It consists of telephone lines, fiber-optic cables, microwave transmission links, cellular networks, communication satellites and undersea telephone cables. Originally a network of fixed-line analog systems, the PSTN is now almost entirely digital in its core. All links are interconnected by switching centers which allows any telephone in the world to communicate with any other. 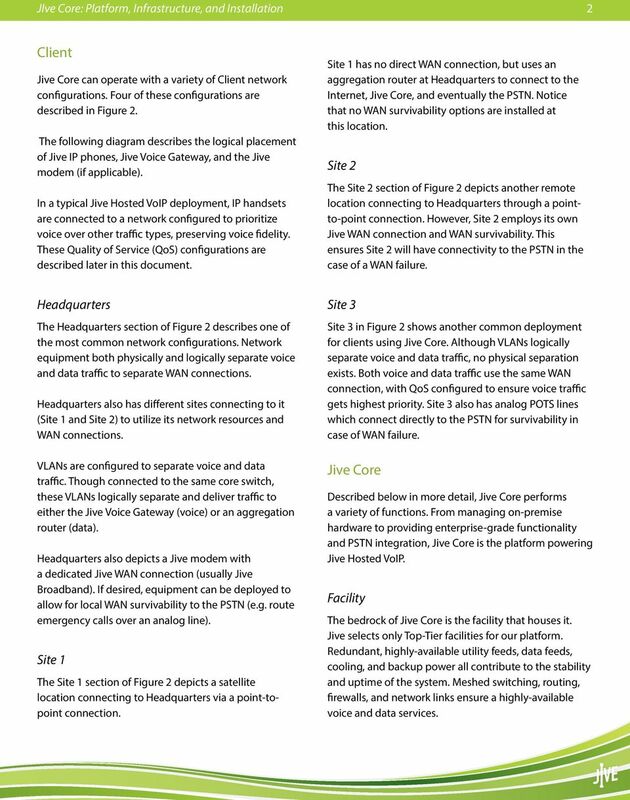 Jive manages relationships with several different providers that deliver PSTN connectivity, including Level3, Verizon, XO Communications, 360 Networks, and others. These Tier 1 providers give Jive broad penetration in the US market, with over 98% of the country eligible for Jive Hosted VoIP. 7 6 Requirements Jive s hosted services have a few basic network and installation requirements which ensure optimal quality and system uptime. In many cases, existing client hardware can satisfy these requirements. Routers and Switches All on-premises hardware are network devices which require an enterprise-grade router to function properly. 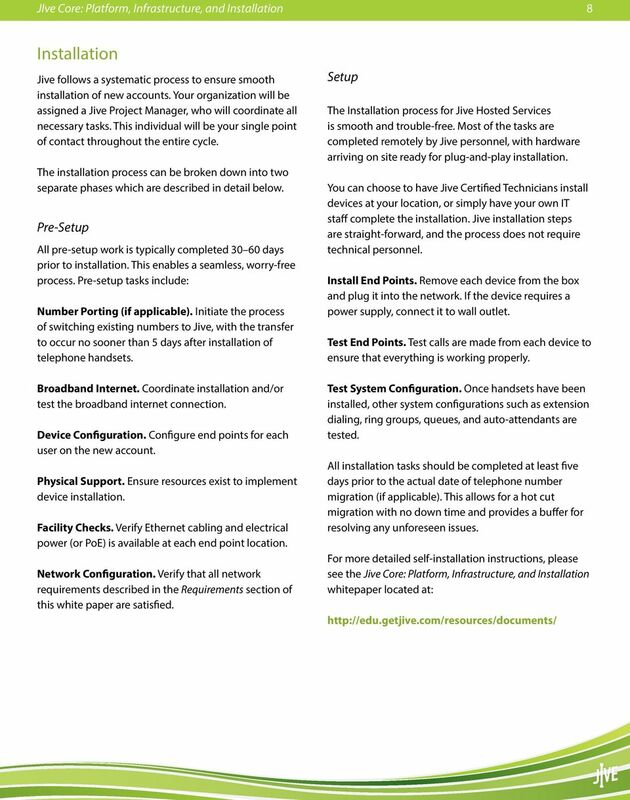 Jive can recommend router hardware if needed. Power over Ethernet (PoE) switches are highly recommended, as they eliminate the need for individual power adapters for each end point and also allows for centralized power redundancy. The following protocols should be installed and available on the network router: Firewalls should be configured with the following settings for optimal functionality: Persistent NAT Connections. NAT keep-alive requests must be allowed every 30 seconds. HTTP. HTTP over port 80 must be enabled. SIP. Multiple UDP connections must be allowed on ports 5060 and RTP. Internally-initiated UDP requests must be allowed on ports 10,000-65,536 for audio and video. NTP. UDP traffic must be allowed on port 143 for Network Time Protocol (NTP). Contact Jive Support for more information on firewall configuration. DHCP. Devices should receive an internal IP address assignment via Dynamic Host Configuration Protocol (DHCP). NAT. All Network Address Translation (NAT) connections must be left open for at least 60 seconds. QoS. In a converged network, Quality of Service (QoS) must be applied to prioritize voice and video traffic over all other traffic types. Public IP Addresses. Some Jive HD Video devices may require public IPs to function properly. Firewalls Firewalls should allow Jive end points to access HTTP, HTTPS, and UDP traffic on the network. Jive end points must be allowed to both send and receive TCP and UDP packets on arbitrary ports and to arbitrary IP addresses. Some network ports may need to be opened manually. Bandwidth All Jive Hosted Services require one or more broadband Internet connections to function properly. Dial-up, standard wireless, and satellite internet connections are not supported and will negatively impact the delivery of Jive Hosted Services. Each Jive voice call requires approximately 90 kbps of synchronous bandwidth. 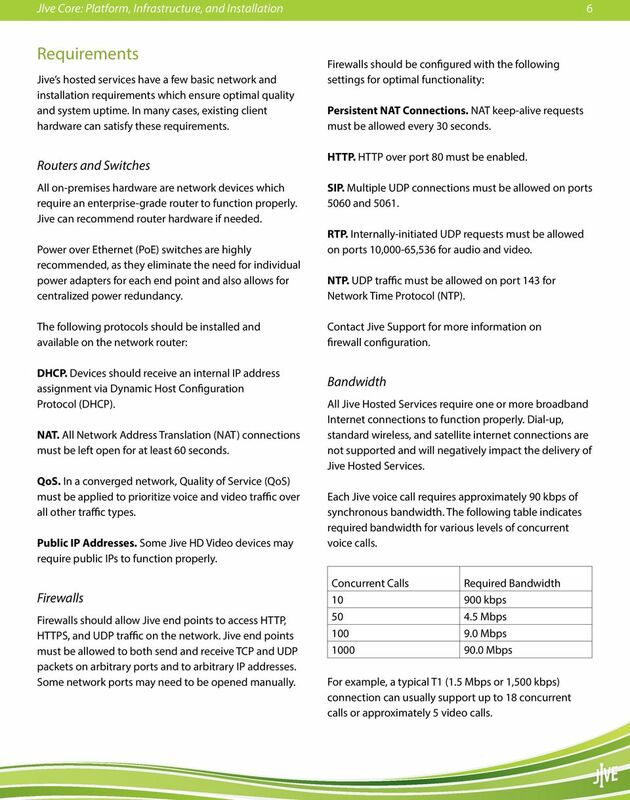 The following table indicates required bandwidth for various levels of concurrent voice calls. Concurrent Calls kbps Mbps Mbps Required Bandwidth Mbps For example, a typical T1 (1.5 Mbps or 1,500 kbps) connection can usually support up to 18 concurrent calls or approximately 5 video calls. 8 7 Network Topology The typical network topology for a Jive hosted services setup is displayed in Figure 4. voice and video traffic from lower priority traffic. VLANs can allocate bandwidth dynamically based on volume, or statically by manual assignment. Class-of-Service Prioritization. Marking I Layer 2 packets with high-priority (5) class tags (802.1p and IP Precedence) allows most enterprise network equipment to distinguish and prioritize voice and video from other traffic on the network. 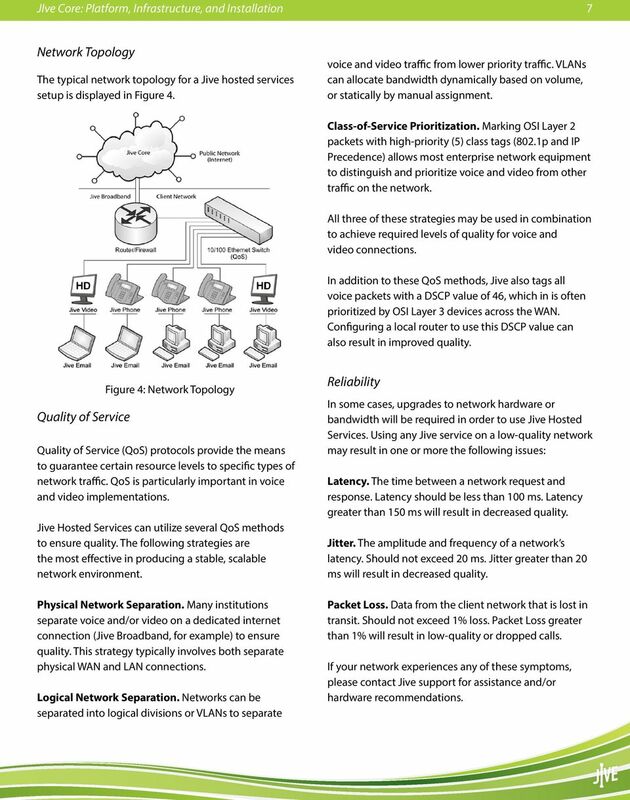 All three of these strategies may be used in combination to achieve required levels of quality for voice and video connections. In addition to these QoS methods, Jive also tags all voice packets with a DSCP value of 46, which in is often prioritized by I Layer 3 devices across the WAN. Configuring a local router to use this DSCP value can also result in improved quality. Quality of Service Figure 4: Network Topology Quality of Service (QoS) protocols provide the means to guarantee certain resource levels to specific types of network traffic. QoS is particularly important in voice and video implementations. Jive Hosted Services can utilize several QoS methods to ensure quality. The following strategies are the most effective in producing a stable, scalable network environment. Physical Network Separation. Many institutions separate voice and/or video on a dedicated internet connection (Jive Broadband, for example) to ensure quality. This strategy typically involves both separate physical WAN and LAN connections. Logical Network Separation. Networks can be separated into logical divisions or VLANs to separate Reliability In some cases, upgrades to network hardware or bandwidth will be required in order to use Jive Hosted Services. Using any Jive service on a low-quality network may result in one or more the following issues: Latency. The time between a network request and response. Latency should be less than 100 ms. Latency greater than 150 ms will result in decreased quality. Jitter. The amplitude and frequency of a network s latency. Should not exceed 20 ms. Jitter greater than 20 ms will result in decreased quality. Packet Loss. Data from the client network that is lost in transit. Should not exceed 1% loss. Packet Loss greater than 1% will result in low-quality or dropped calls. If your network experiences any of these symptoms, please contact Jive support for assistance and/or hardware recommendations. 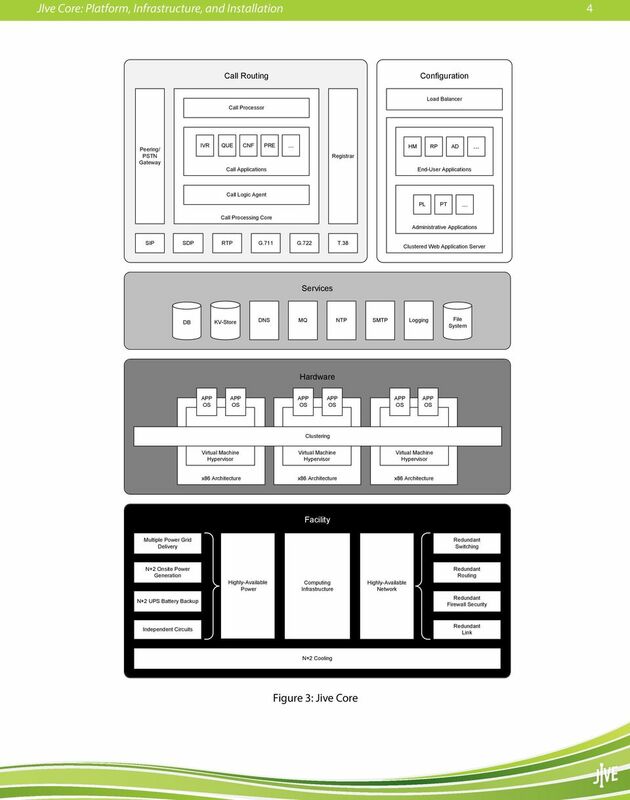 This chapter presents some design considerations for provisioning network bandwidth, providing security and access to corporate data stores, and ensuring Quality of Service (QoS) for Unified CCX applications. 1.1 Multipoint Control Unit (MCU) A. The MCU shall be capable of supporting (20) continuous presence HD Video Ports at 720P/30Hz resolution and (40) continuous presence ports at 480P/30Hz resolution. B.